~ When I encounter a snake in the house, the first thing to do is find it, if it's hiding. I then move very quickly to pick it up, wearing gloves. You can even "smother" it in a towel and take it outside. If it's venomous, I use snake tongs and transport it in a snake bag. ~ The best way for a homeowner to remove a snake from a house is to either call a pro like me (click the map at the bottom of this page for a list of thousands of snake pros) or to buy a snake trap, and set it in the house. Catch rates with the trap are almost 100% inside. ~ Or, if the situation allows, if you see the snake and it's slow enough, just grab a broom and sweep it out the door for free! ~ After it's out, the most important thing to do is to find the gaps or holes it used to slither in - no, it didn't come in with the groceries - and seal those openings shut. Snakes can't dig or chew, so you can just use caulk to seal the holes. Few things are as creepy as walking downstairs in the middle of the night for a glass of water, turning on your kitchen light, and seeing a coiled, black snake under your kitchen table. If you’re even less fortunate, you’ll get to see the snake slither in front of you just as the light flicks on. For homeowners in certain parts of the country, this is the reality of their lifestyles. And it could be worse. In some countries, like Brazil, it is standard protocol to beat your bed sheets with a stick prior to climbing into bed. For those of us who aren’t used to living that closely with nature, there are ways to handle the occasional snake in the house. 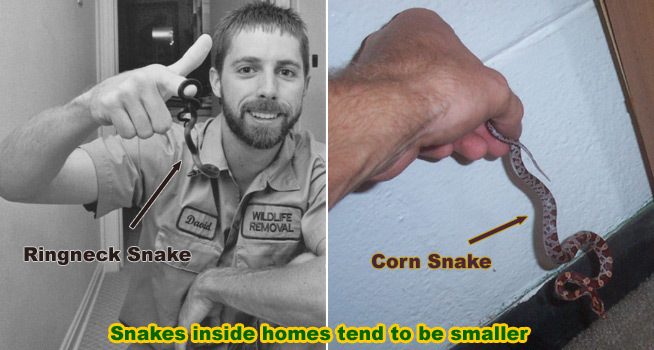 Because a snake in the house has to be removed, it is important to know what kind of snake you are dealing with. A poisonous snake should not be handled, and the room the snake is in should be completely closed off until help arrives. If possible to do safely, a large bin can be tossed over the snake and then weighted down. You should never attempt to get near a poisonous snake needlessly. You may seriously underestimate the striking distance of a venomous snake. The muscles in a serpent’s body are very strong and can propel some animals as high as a person’s head. If it is reasonable to close off that room of the house, do so. Seal any openings beneath doors with rolled towels or sheets, pressing them firmly against the door with weights on the outside. Call a professional to come and remove the snake. Non-venomous snakes are a little less intimidating, though they can still strike and bite if they feel threatened. Assuming you can see the snake, you will want to block off any areas the reptile can slither into or under. Stoves, refrigerators, couches, cabinets, and the like will make your snake removal job a lot harder if you don’t block them off first. Using rolled towels or sheets, stuff the gaps under your appliances and furniture, moving as slowly as you can so you don’t startle the snake. Once everything is blocked off, close off the room so the snake cannot escape that way, either. Now, you can either shoo the snake into a bin with a broom, or you can plop a large towel or blanket over the snake and scoop it into a pillowcase. For those less inclined to handle the serpent, the broom and bin solution is best. If you are leery of even that solution, cover the snake with your heavy duty bin and poke a few air holes in the top. Call a professional and wait for them to arrive. Ultimately, if you find a snake in your home and are not certain if it is poisonous or not, always leave it alone. An injury is not worth the risk to try to remove the snake yourself. Even non-poisonous snake bites can cause serious injuries. Always err on the side of caution. Standard methods of determining if a snake is poisonous or not—such as head shape, color, or tail rattling—should not be relied on. Too many serpents in the animal world are exceptions to the rules of categorizing, and it’s always better to be safe than sorry. If you do get bit by a poisonous snake, you need immediate medical intervention. Some poisons will numb and paralyze your limbs and some poisons will eat away the flesh near the bite wound. All poisons are made to kill, so don’t waste any time getting to the hospital. A non- poisonous snake bite, though less likely to be fatal, can be incredibly painful and will likely bleed profusely due to anticoagulants in the snake’s saliva. Getting bit is no joke, which is why a snake in the house should be left to the professionals. You basically have three options for getting rid of your snake(s). First, you can call a professional wildlife expert from my below directory. This person can catch and remove the snake(s) and take other actions necessary to solve the snake problem. Second, you can purchase a snake trap if you wish to catch the snake yourself. Third, you can modify your land and seal up your house to help keep snakes away and out of the house. You can also read about How to find and remove a snake in your attic. For more information, go to my Snake Removal - How to Get Rid of Snakes home page. For more information, go to my Snake Removal - How to Get Rid of Snakes home page. You can also visit Keep Snakes Out of Your House or Yard for more info on that subject.